August | 2009 | My name is Kervie and I'm not here to make sense. Hello! I am proud to announce the official launch of thinkpyxl.com. 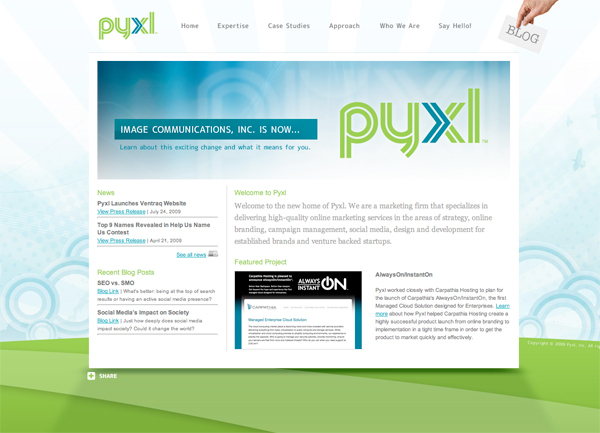 I had a lot of fun designing the logo and the site since we revealed the new name back in June, and I am very excited that the new designs reflect the type of company Pyxl is today. We are young, energetic and most of all, enjoy our professions. Check out the official press release and learn more about the launch. Below are some thoughts and ideas that we put into consideration while designing the new site. 1. The new color scheme immediately gravitated me towards using a landscape. But without being too corny – I decided to go completely abstract, since in essence – our company couldn’t be described in one specific concept. It started when we decided to not use “pixels/cubes/boxes” for the logo and the idea carried on for the design of the site. 2. We wanted the site to be a playful and fun. No holds barred in coming up with the composition of different elements seen throughout the site. The tone of our copy was serious yet we wanted to off-set it with a contradicting laid-back design feel. 3. I wanted to bring back our “hand model” for the blog link as a homage to the Help Us Name Us campaign which gave us our new company name. 4. By following the same process of making everything abstract, I was able to freely illustrate each section’s message with the use of different design elements that I created or have in my library. This enabled us to tell an interesting story as our audience go through individual sections of the site. Check out the Expertise Section for a closer look. 5. On a really low budget, we were happy how our photos turned out considering we only had one camera and no lighting equipment. We scouted areas near our office and selected Market Square in downtown Knoxville as a backdrop for our photo shoot. 5. Overall, we really strived for a different approach to our site compared to most of the other sites we’ve done simply for the reason that we were free of any boundaries – which made this a very challenging yet fun project. That’s about it in a nutshell. We’re constantly tinkering and updating the site and will be adding more functionality throughout the year. Thanks to all that submitted feedback through email and Twitter. We can’t wait to show you what we have for version 2.0.